It is believed that one of the reasons behind the mighty growth of Inca Empire was the techniques they developed to store and preserve foods. They had storehouse of foods throughout the Empire. Inca had store three to seven years of foods at their state warehouse. They stored potato and other tubers by setting out them in dry days and cold nights. So the foods became freeze-dried very soon. They also preserved meat. They dried and slated meat and store them in the state warehouse. So these techniques helped them to combats droughts. Even during the droughts they could feed the standing army for years. There was a great variety of vegetables during those days. Since in that period the vast land under Inca was stretched from north to south, they had different climate zones. Also the altitude was different in different zones. Foods that was grown in mountain zone was totally different than the food that was grown in the coastal zone. 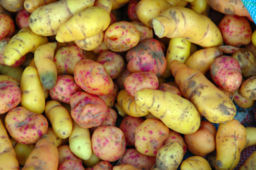 Potato was one of the main food of Inca. They had several hundreds varieties of potato. I hope you know potato is actually originated from Inca people. They used potato in different dishes, among them stews and soups were very common. Maize was another very popular food during Inca days. Maize was a common food in those days. Oca was also popular. Oca had two types. sweet and bitter. Sweet one was also preserved and used as sweetener, until the arrival of sugar. Ullucu and arracacha, which were similar like carrot was used in soups and stews. Another sweet, starchy root named Achira was used in those days. Usually they baked Achira in earth oven before they took it. Some verities of seaweed were also popular in Inca days. They eat them either dried it even fresh. Blue algae was eaten raw. It was also processed raw for Storage. It was also used in making dessert in those days. One of the favorite staple food of Inca people was Amaranth. Now a days it is called kiwicha in the Andes region. Amaranth was also used to make effigies of animals, which Inca used in different religious ceremonies. Afterwords the Spaniards banned Amaranth for this reasons. In those days Chili peppers were an important part of Inca Cuisine. Aji Amarillo or yellow pepper was the must ingredient for some of the Inca dishes. Llamas and Alpacas were the main domesticated animals of Inca. Main source of meat for common people was Guinea pigs. Guinea Pigs are known there as Cuy. Guinea pigs were easy to keep and they multiplied rapidly. So Guinea pigs were popular among general people. If you go to Peru, one of the popular menu is	Cuy, which is a fried whole Guinea Pig. Llamas and Vicunas had to be less than three years of old, when taken by the Nobles. Emperor and their family consumed wild ducks. Fishes were brought fresh from the coast by runners for Inca Emperor. Dried fish was one of the mainstays of the Inca army. Also to the people of coastal regions fish was a common diet. Skates, Limpets, rays, mullets, small sharks and bonito were some of the popular fished consumed by Inca. Penguins, seabirds, dolphins and sea lions were also in the list of Inca Cuisine. Chicha was the main drink for the people during Inca period. Chicha was made from jora maize. Chicha could be made from other fruits or grains also. Chicha contained less then 3% alcohol and taken in vast quantities through the whole Inca region. During religious festival Chicha was the only drink supplied. Many Inca dishes are still popular in Peru and served in Peruvian Restaurants. Click here to read more.